After Sesame Street launched and it was clear the show was a hit, the Children’s Television Workshop team began looking for other ways to connect with their audiences and extend the lessons taught on screen (not to mention creating a revenue stream to support the show). Starting during the second season, books, toys and records went into production featuring the lovable Muppets, all with educational merit. 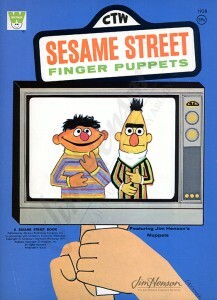 The success of Sesame Street’s first cast album in 1970 and the quantity of great music being written for the show encouraged the team to brainstorm about other types of records they might produce. In 1971, they decided on a 26-track album focusing on the alphabet. 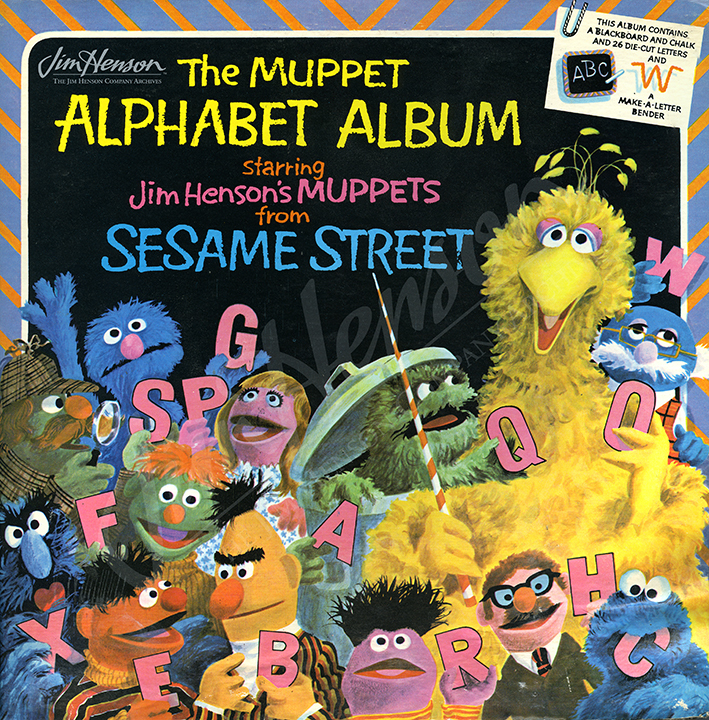 Some Sesame classics appear on the album, like Joe Raposo’s “C Is For Cookie” and “Would You Like to Buy An O?” Others were written specifically for the release, like “Just Because” by Jim and Jerry Juhl for the letter Y and “Sammy the Snake” by Jeff Moss. The original 1971 album jacket opened up to reveal a blackboard design and was packaged with chalk and punch-out alphabet letters, encouraging listeners to practice writing while listening to the songs. The 1976 re-release dispensed with the lumpy chalk and instead had little drawings illustrating words that started with each letter. One song on the album celebrated the camaraderie of the team: “J Friends” by Jeff Moss. Watch and hear about Joe [Raposo], Jane [Henson], Jim [Henson], and Joan [Ganz Cooney, founder of Children’s Television Workshop]. Somehow, Jon [Stone, producer and director] and Jeff [Moss, writer and composer] got left out. Read more about early Sesame Street products. Sesame Street finger puppets produced in 1971. 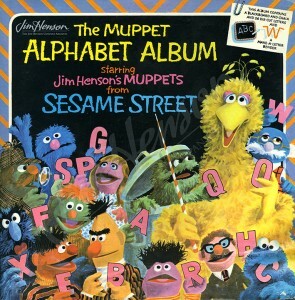 The 1971 Muppet Alphabet Album. This entry was posted in Sesame Street and tagged Carroll Spinney, Fran Brill, Frank Oz, hildren’s Television Workshop, Jane Henson, Jeff Moss, Jerry Juhl, Jerry Nelson, Joan Ganz Cooney, Joe Raposo, Jon Stone. Bookmark the permalink.